Architectural | Illingworth & Rodkin, Inc.
Illingworth & Rodkin advises clients on building design and acoustical material selection and placement to improve interior room acoustics for spaces such as offices, churches, amphitheaters, performance halls, winery tasting rooms, restaurants, multi-use facilities, and community centers. 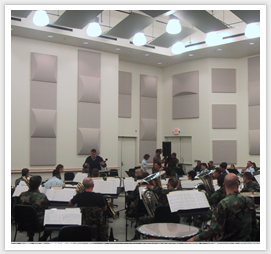 We analyze architectural acoustics and sound isolation design components relating to new and existing buildings. We also assess wall and window construction components and building techniques needed to achieve Building Code and/or HUD requirements for interior noise levels attributable to exterior or interior noise sources.